Game conventions are events that bring together several gamers to participate in various types of gaming. Some game conventions focus on video gaming, with huge tournaments and prizes, while others center around pen and paper roleplaying games. Several large gaming cons, such as E3 and PAX, tend to focus around video gaming, with producers and game developers attending to show off their latest creations. Most other game cons are smaller events with a focus around table top games, however some smaller shows also focus on video gaming. There are also many conventions based in other genres that have a significant gaming emphasis, such as Dragon*con. 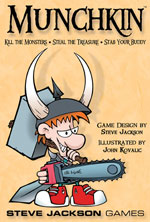 Some things you might play at gaming cons are games like Munchkin from Steve Jackson games. Board games like this are more popular in the 'open gaming' areas, while tournaments usually revolve around more complex strategy-type board games like Dominion. 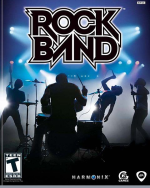 Bigger conventions, or other event types that have a smaller gaming sections usually focus instead on video games like Rock Band shown above. Most events we list as gaming cons will feature multiple different types of gaming tournaments, either board games or video games. Check the convention's website to find out which type of gaming the event focuses on.